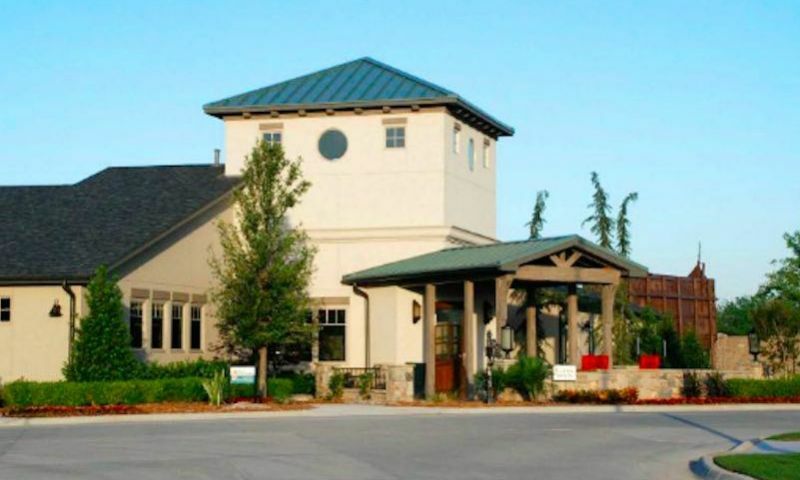 Hyde Park at Tulsa Hills is an active adult community located in Tulsa, Oklahoma. This 55+ neighborhood began construction in 2011 and upon completion will feature 165 single-family homes well-equipped for homebuyers looking to downsize and enjoy a simpler lifestyle. With terrific amenities, proximity to downtown Tulsa, The Walk at Tulsa Hills and Tulsa Hills shopping areas, Hyde Park at Tulsa Hills is a great option for active adults looking for a personalized home in an exciting new community. At the center of the community is the Hyde-Out clubhouse where residents gather for social activities or stay in shape. The Hyde-Out provides several ways of breaking a sweat with an exercise room, aerobics and dance studio and two indoor pickleball courts. Relax after a workout in the library, over a game at the billiards table, or with friends in the card room. A catering kitchen with dining room is perfect for community get-togethers. The Hyde-Out also provides a coffee bar for a quick pick-me-up. The great amenities continue outdoors with a lovely pool and patio, and cabana with a flat screen TV for relaxing outside. Hone your game on the tennis court or six-hole putting green. A walking path circles the scenic ponds, providing great views during an afternoon stroll. Hyde Park at Tulsa Hills will have 165 homes upon completion. The single-family homes within Hyde Park at Tulsa Hills are well-equipped for today's active adult homebuyer and are offered as bungalows, cottages, and villas. Ranging in size from approximately 1,450 to over 3,000 square feet, these custom homes generally offer two bedrooms, two bathrooms and an attached two-car garage, but can be customized to three bedrooms and a three-car garage. The homes are built with quality craftsmanship that includes energy-efficient features, wood floors, granite countertops, stainless steel appliances screened-in porches and private patios. Living in Hyde Park at Tulsa Hills means having several ways of staying physically and socially active. Residents often attend art classes, seminars, and coffee and chat events. Get competitive with your friends over games of dominoes, bridge, or Mah Jongg. Getting to know new neighbors is easy with first Saturday brunches and holiday parties. However you would like to stay active, you will have plenty of time to enjoy it thanks to the association fee that covers lawn maintenance and landscaping. Hyde Park at Tulsa Hills is in Tulsa, Oklahoma. The Tulsa Hills Shopping Center, providing everyday conveniences, is less than two miles away. Hillcrest Hospital South is approximately 13 miles away while the Tulsa International Airport is just 17 miles away. The Blue Dome District in downtown Tulsa features nine square blocks of entertainment venues, boutique shops and exciting restaurants. Utica Square is home to some of the best shopping the region while Tulsa also hosts the Gilcrease Museum, the Philbrook Museum of Art and the system of Tulsa River Parks for the outdoor enthusiast. Active adults near Tulsa, Oklahoma will adore all that Hyde Park at Tulsa Hills and the area have to offer. There are plenty of activities available in Hyde Park at Tulsa Hills. Here is a sample of some of the clubs, activities and classes offered here. The single-family homes within Hyde Park at Tulsa Hills are well-equipped for today's active adult homebuyer. Ranging in size from approximately 1,400 to over 3,000 square feet, these custom homes feature two bedrooms, two bathrooms and an attached two-car garage. Some have desirable features like granite countertops and stainless steel appliances. This is a very nice community with some gorgeous homes. The builder did a wonderful job on the clubhouse that has it's own indoor pickleball court! The outdoor pool looked amazing and the detail on the finishes inside were very impressive. Definitely will give this place a 5 star! Hyde Park was the perfect option for me as my large home in Sapulpa was way more than I needed. I heard the TV promo, and knew, this is where I wanted to be. I think about only dirt and earth-moving equipment that were here when I purchased, built, and moved here in November, 2012. I got the vision right away. The conveniences of the shopping centers, church and our crown jewel, The Hyde-Out, gave me every reason to want to be here, and now the bonus is the amazing people that continue to move in and join our HP family. 55places.com is not affiliated with the developer(s) or homeowners association of Hyde Park at Tulsa Hills. The information you submit is distributed to a 55places.com Partner Agent, who is a licensed real estate agent. The information regarding Hyde Park at Tulsa Hills has not been verified or approved by the developer or homeowners association. Please verify all information prior to purchasing. 55places.com is not responsible for any errors regarding the information displayed on this website.